Kansas City Chiefs defensive end Mike DeVito (70) celebrates after sacking Oakland Raiders quarterback Derek Carr (4) during the second half of an NFL football game in Kansas City, Missouri, Sunday, Jan. 3, 2016. Mike DeVito has been very much in demand this week. 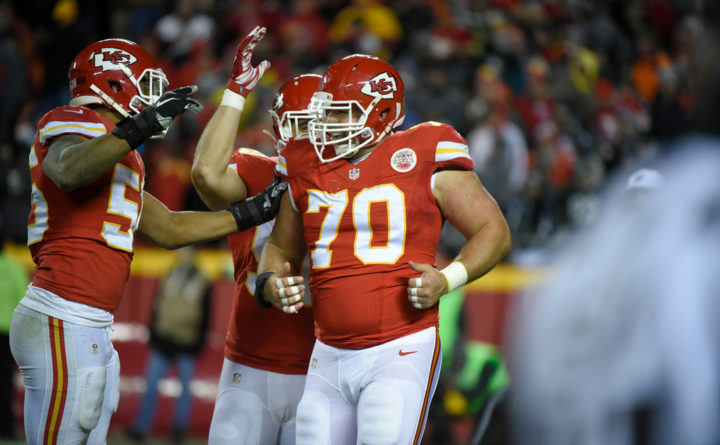 The former University of Maine All-Atlantic 10 nose tackle, who lives in Hampden with wife Jessie (Martin) and their two sons Rocco and Sal, spent the last three seasons of his nine-year National Football League career with the Kansas City Chiefs. He played for head coach Andy Reid, whose Chiefs host the New England Patriots in Sunday night’s AFC championship game and a berth in the Super Bowl. DeVito has been inundated with interview requests. “People in Kansas City know I live up in New England now and want to talk about (the Patriots) and people in New England want me to talk about Kansas City,” DeVito said. “It has been wild. It has been a fun week,” DeVito, who spent his first six pro seasons with the New York Jets, said. DeVito, who retired on April 11, 2016 after suffering two concussions during the 2015 season, played in nine NFL playoff games and 110 regular-season games. “That’s a lot of playoff games in the course of a nine-year career,” he said. DeVito has fond memories of playing at Kansas City’s Arrowhead Stadium in front of loud, enthusiastic crowds. He also enjoyed playing for Reid. DeVito predicted that the game will be a shootout just like the Oct. 15 regular-season game won by the Patriots 43-40 in Foxboro, Massachusetts. The weather is going to be frigid in Kansas City, but the average January temperatures for Boston and Kansas City are quite similar. The average low for both cities is 22 degrees. But DeVito didn’t think it would make a difference. He finds it amusing that people are saying the Patriots aren’t as good as they usually are because they went 11-5 during the regular season. “If you told me I was going to go 11-5 during the regular season, I’d say, ‘Where do I sign (the contract)?’” DeVito said. “They have done an incredible job staying consistent. This will be their eighth straight conference championship game,” DeVito said. “It doesn’t hurt having the greatest coach of all time (Bill Belichick) and the greatest quarterback to ever play the game (Tom Brady) for two decades,” he added. He pointed out that Brady has made sacrifices to help the organization sustain its prominence. His $20.5 million salary ranks only 16th among NFL quarterbacks. “He gets paid much less than he deserves. But he does it so the Patriots can sign other players in order to be competitive year in and year out,” DeVito said. Changing enrollments pose a challenge for reclassifying high school sports. Small basketball programs might see some relief with 2 proposals.